Need help dealing with email issues or Mail app errors on your iPhone 6s? If so, then this content is for you. Read on to get help. Nowadays, many people would consider smartphone as a necessity. It’s becoming part of everyone’s daily routine to use their smartphone for various purposes, whether it would be for business or personal matters. One of the many benefits of having a smartphone is being able to keep in touch with important people and stay updated with the latest from work, business market, or other global trends. Check your mailbox and respond to important emails anytime and anywhere for as long as your smartphone is with and that you’re connected to your mobile network. All these along with other benefits are enough reasons for people to secure at least a smartphone for his/her daily use. But not every day is a good day for mobile email subscribers as network problems are inevitable. What causes email problems to occur on your iPhone 6s? Email is among the mobile services that rely much on your device’s network availability. For you to send and receive mobile emails, your device needs to have an active network connection. With unstable or unavailable network connection, mobile email service also won’t work. Even the highest-tiered smartphones including Apple’s flagship smartphones like the iPhone 6s have no exemptions to this. In fact, emails problems are among the widespread complaints raised by many iPhone owners as posted in relevant sites and online forums. Problems in sending and receiving emails, mail server errors, mailbox locked, and other Mail app issues are a common blast. There are many possible reasons as to why you won’t be able to send or receive emails with the iPhone 6s Mail app. Highlighted below are the common factors that triggers email problems to occur in mobile devices like the Apple iPhone 6s. Network problems are the most common culprit. As explicated earlier, an active network connection is required in order for you to use email service on your mobile phone. Thus, if something goes wrong with the network, then most likely you will likely to have some troubles with your phone’s email service. Random software glitches are also among the possible causes. Just like any other apps, the Mail app can sometimes run into random software malfunctions. As a result, there are times when emails won’t send or reach your mailbox. Often times, issues like this are resolved by restarting the app or the device itself. Incorrect email account setup is also a possible reason as to why email service won’t function as it should on your device. Incorrect settings such as wrong email address or password as well as incorrect server settings information would also give you the same trouble when using the Mail app on your iPhone. Account issues can also hinder outgoing services including email sending on your device. There might be some restrictions imposed by your email carrier for your account’s email services. How to fix email problems on your iPhone 6s? It is recommended to back up your iPhone before you do any troubleshooting procedures that involve deleting or changing your email account settings. It is possible that your previously downloaded email might be removed from your iPhone, if you delete or change your email account settings. Once you’re all set, try the following methods. Step 1. Check and ensure your iPhone is connected to the Internet either through Cellular Data or Wi-Fi connection. If you are using Wi-Fi network connectivity, verify and ensure that Wi-Fi is enabled and that you can connect to the Internet over Wi-Fi. Do the same with Cellular Data network connectivity. To check if Wi-Fi is enabled on your iPhone 6s, go to Settings-> Wi-Fi. If necessary, toggle the Wi-Fi switch to turn on or enable Wi-Fi feature on your iPhone. Alternatively, you can open the Control Center by swiping up from the bottom of your Home screen. Tap the Wi-Fi button/icon in the Control Center to enable or turn the feature on. To check if Cellular Data is enabled on your iPhone 6s, go to Settings-> Cellular Data. Make sure the Cellular Data switch is enabled. If not, then toggle the switch to turn it on. After you have verified that Wi-Fi or Cellular Data network is enabled on your iPhone, try to open the Safari browser and navigate to a website to see if you can connect. If you can’t, then you need to deal with the problem on network connectivity first. Once the connectivity issue is fixed, email services will most likely work normal again. Step 2. Quit and restart Mail app. To see if you can now send and receive emails without any issue, create a test mail to send and receive. Step 3. Reboot (soft reset) your iPhone. Your iPhone should then reboot. After the reboot, try to open the Mail app and create a test email to see if you can now send and receive, and that everything in the app is working fine already. Step 4. Update to the latest iOS version. Another potential solution you can try on if an iPhone reboot won’t work is by updating your iPhone 6s iOS to the latest version. Aside from new features and service enhancement, software updates also contain bug fixes including those affecting the Mail app. Should this be the one causing you trouble in using email service on your iPhone, an iOS update installation might be the key to resolving the underlying cause. To check if an iOS update is available for your iPhone 6s, go to Settings-> General-> About-> Software Update. You will see a notice if an update is available. To proceed with the iOS update download and installation, tap the option to Download and Install then follow the rest of the onscreen instructions to complete the process. Step 5. Delete or remove the problematic email account and then set it up again. 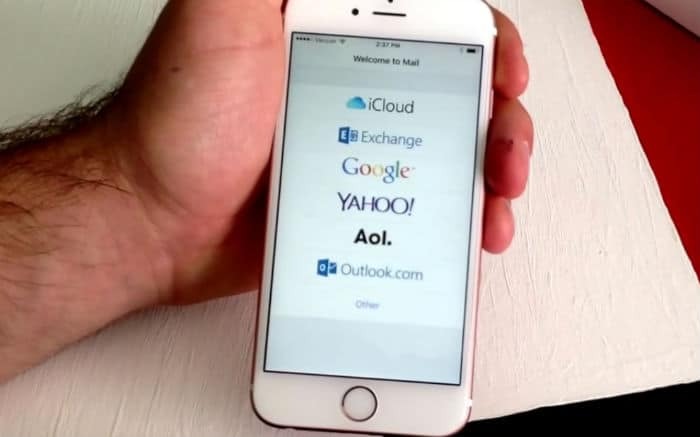 Many iPhone users who have encountered problems with the Mail app were able to fix them by deleting or removing the email account they’re having problems with and then set it up again. This is most likely the fix you need if the problem lies with the settings being used. For example, if you’ve entered the wrong server address, username, or password when setting up the account on your device. It wouldn’t hurt to give it a try to see if this will work on your end. Select the account that you’re having problem with. If prompted with a message, tap the option to Delete from My iPhone to continue. Once you have successfully completed the email setup process, you’ll be taken to your email inbox. Messages will immediately download from your account to your phone. Alternatively, you can sync the account to your phone using iTunes. Step 6. Check your email account settings and re-configure if necessary. iOS automatically uses the correct account settings for many email providers when you set up your email account on your device. You can compare the settings in the Mail app to the settings for your email account, if you want to make sure that your account settings are correct. To do so, go to Settings-> Mail-> Accounts. Tap your email address next to Account. Doing so will open the account information including the incoming and outgoing mail servers. Verify and ensure the recommended settings for your email account are correct. You can use the Mail Settings Lookup to see if they’re similar with what’s showing on your screen. Contact your email provider or system administrator if you do not see the settings for your email account. Note: You can only send email when you’re connected to your email provider’s network if your email provider requires your account to use port 25. If you’re getting error messages saying that your email was not sent, sending failed and the like, here’s what you can try. If you are getting an error message saying that the password you entered is incorrect or invalid password, here’s what you can try. Recommended Solution: If the Mail app prompts you to enter a password for your email account, verify that the password you entered is correct. You can sign in to your email provider’s website to check your email address and password. If you are not sure or forgotten the password, then you should contact your email provider or system administrator for further assistance. Your last best option is to contact your email service provider or system administrator. Do this to verify if there is a service outage that might have caused temporary service interruptions on email transactions. Also ask your email provider or system administrator if you enabled any security features or restrictions for your email account like two-step verification. In this case, a special password or request authorization might be necessary to send and receive email on your device. You can also seek further assistance in setting up the email account using the correct information and email settings configuration straight from your email carrier’s technical support team. It’s another way to ensure that you are doing the right thing.